An inquiry is an admissions-related question. They may come from existing Leads or people you haven't heard about yet. 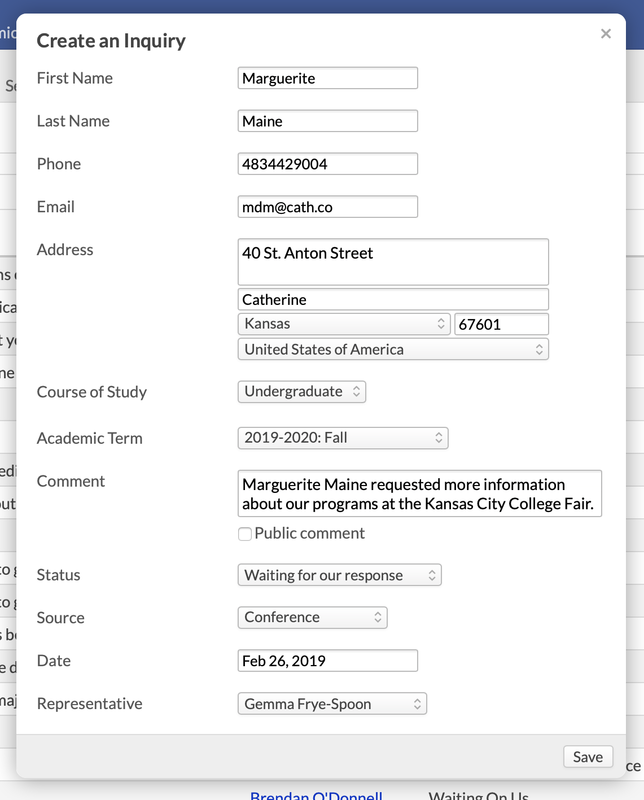 The inquirer may send it to you via the online inquiry form, or you may record it yourself (after, say, a phone call or meeting with someone at a recruiting conference). Inquiries are likely to be the first meaningful interaction you'll have with an interested student. Previous to this, the person might have been in your system as a Lead with a status of Prospect; you might have been sending them materials to get them interested, but you didn't know if anything was piquing their curiosity. Or you might not have known they were out there at all. Whatever the case, an inquiry indicates that they've taken some sort of initiative to hear more from you: they've now shown tangible interest in your school. Most inquiries will come to you via one of your inquiry Forms. You can also manually add them using the Create an inquiry function on Admissions > inquiries (see below). The inquiries report lists all of your inquiries in chronological order. You'll find the most recent inquiry at the top of the list. The number in the Inquiries tab indicates the number of inquiries that are set to Waiting on us. Use the filter to focus the report on particular kinds of inquiries—for example, those assigned to a particular representative, or those with a particular status. The representative is assigned several ways (described in detail here). Verified refers to whether the email address provided in the inquiry has been verified. indicates that the inquiry has not been linked to a person. Assign Representative: Select a representative for the inquiries shown on the report. This article has more details. Export XLS: Creates a spreadsheet of the report. Email/Text Inquiries: Lets you email or text the inquirers all at once. Tag Results or Untag Results: Create and add a new tag to all the inquiries (that is, those linked to a person) returned by your filter conditions, or search existing tags and remove them from anyone in your filtered group with that tag. Name and Email fields are required for all inquiries. Name and contact info fields are self-explanatory, right? If the student is from another country, first select the country from the drop-down; the other fields will then accept the correct address information. Contact info fields can be updated later on the inquiry page. If you're using the inquiry form to collect course of study information, make those selections. Comments are optional (but helpful, no? ); check whether you wish to email the comment to the inquirer. Select a Lead Source from the drop-down. The Status indicates what you need to do next; they should be self-explanatory. Every now and then, you might want to Close the inquiry immediately. For example, you could create an inquiry just to record a brief phone call that helped the student figure out he isn't interested. Finally, select an Admissions Representative (when manually-adding inquiries, Lead Routing doesn't apply). Click the inquirer's name to go to the inquiry's page. On the left side of the screen you'll see a history of all comments made on this inquiry. 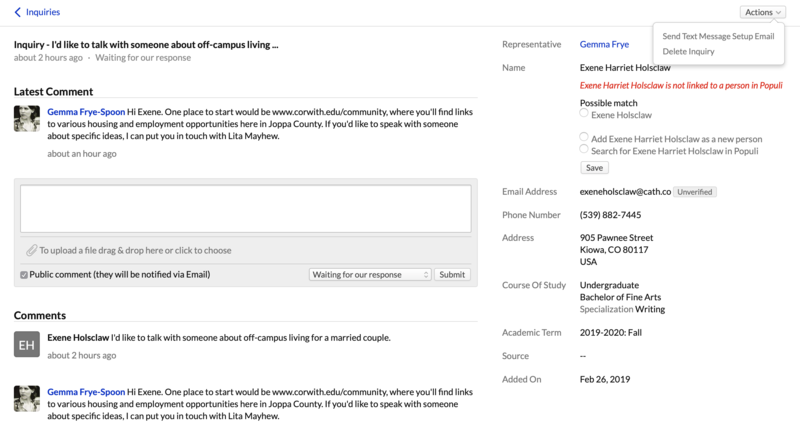 Internal comments are visible only to Admissions-related users; Public comments have been emailed or texted to the inquirer. Enter your own comments in the text box. Check to email the comment to the inquirer. If the inquirer has a verified mobile/text number, you can also communicate with her via text message (which doesn't accept attachments). You can attach files to any non-text comment. If you email the comment, this file will be sent as an attachment. Set the status: you're either waiting for their response, they're waiting for yours, or you're closing this inquiry. Click Submit to make it part of the inquiry. Likewise, if you communicate with her via text, she need only reply to the message. 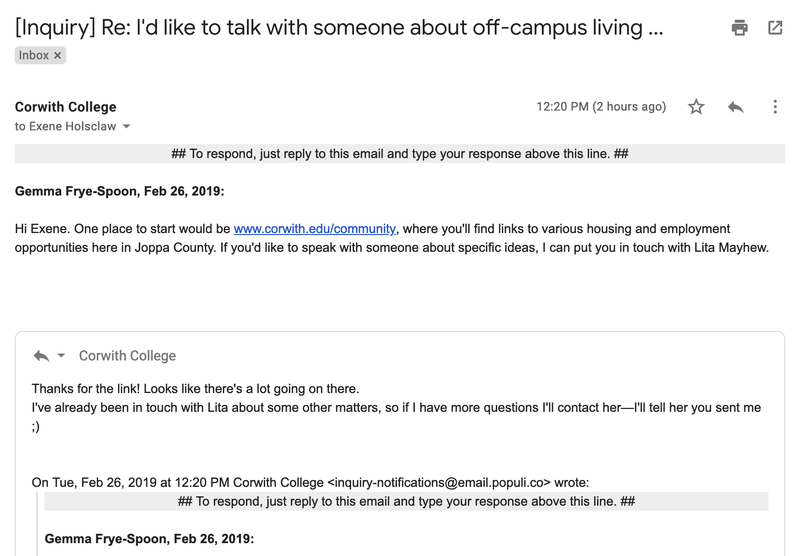 Remember that inquiries are not actually people—the point of an inquiry is to connect it to a Lead as soon as you see fit. Possible match: If Populi matches the inquiry to an existing person in your database, you'll see them listed here. Matches are based on some combination of name and contact information. Click a suggested name to go to that person's profile. If it's a good match, click the radio button and then Apply. Add as a new person: Click the radio button and then Apply to create a new person based on the inquiry info—this person will automatically be created as a Lead. Link to an existing person: If there are no matches, but you know this person is already in Populi (say, they're entered under their maiden name but they inquired after getting married), click the radio button and then search for existing people. Once you've found the match, click their name and then Apply. The name from the inquiry will be replaced by the name of the person to whom you linked it; all other information will be added to anything that already exists. Contact info, unless you've linked the inquiry to a person, in which case you'll change that on their Profile > Info view. To delete an inquiry, click Actions and select Delete inquiry. Once you confirm, the inquiry is all gone—there's no undo!